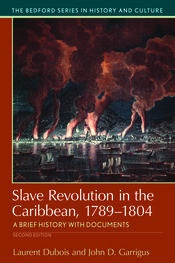 Slave Revolution in the Caribbean tells the story of the slave revolutions that reconfigured the political geography of the Americas between 1789 and 1804 with a selection of primary sources across Atlantic, U.S., and Caribbean history. The collection explores the complexities of this era, now recognized as a crucial turning point in the history of slavery, racism, and the broader meaning of democracy and human rights. New documents include material from a 1757 poisoning case, a 1793 illustration depicting recently emancipated black fighters, and contemporary Vodou songs. These documents help students get closer to the experience of black revolutionaries. Additional support comes from document headnotes as well as a revised Chronology, Bibliography, and Questions for Consideration.